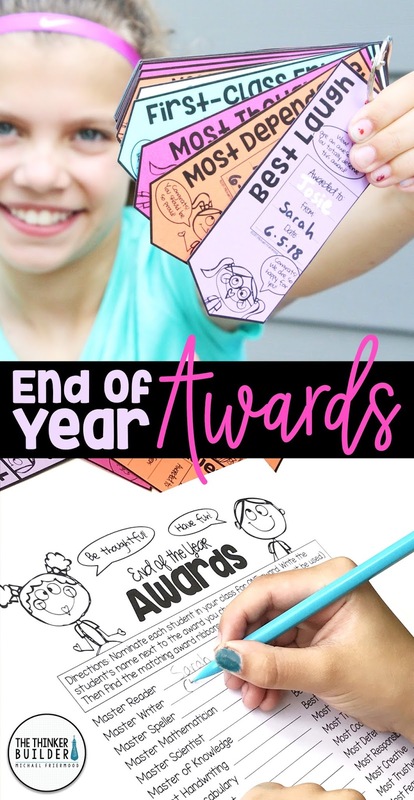 Have you been thinking about giving your students end of the year awards? 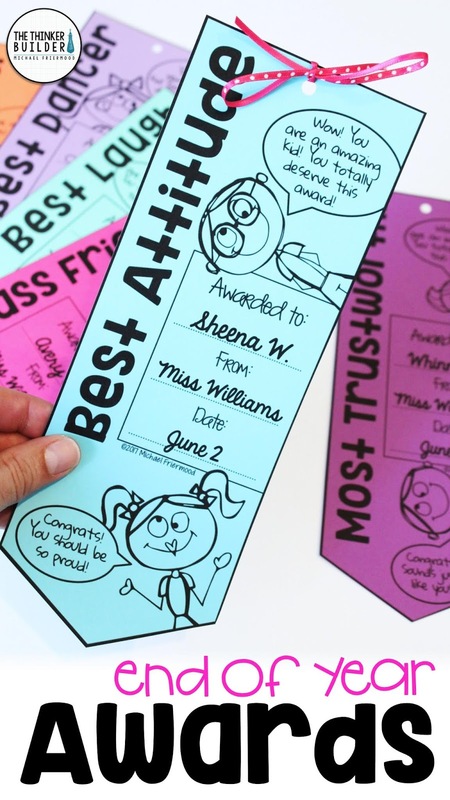 Class awards help make the end of the school year special and memorable. Let's look at a few keys to making the most of your end of year awards. Sure, those very official-looking plain white certificates printed with professional fonts have their place. But for awards given to a single class of students from you, their teacher, try branching out a bit. Like the fresh End of Year Award Ribbons you see below. From the shape to the snappy little quotes of kudos, they add the perfect amount of flair to a set of awards. Try to strike a balance with the chosen award categories between fun and meaningful. Consider giving awards for more than just academics. 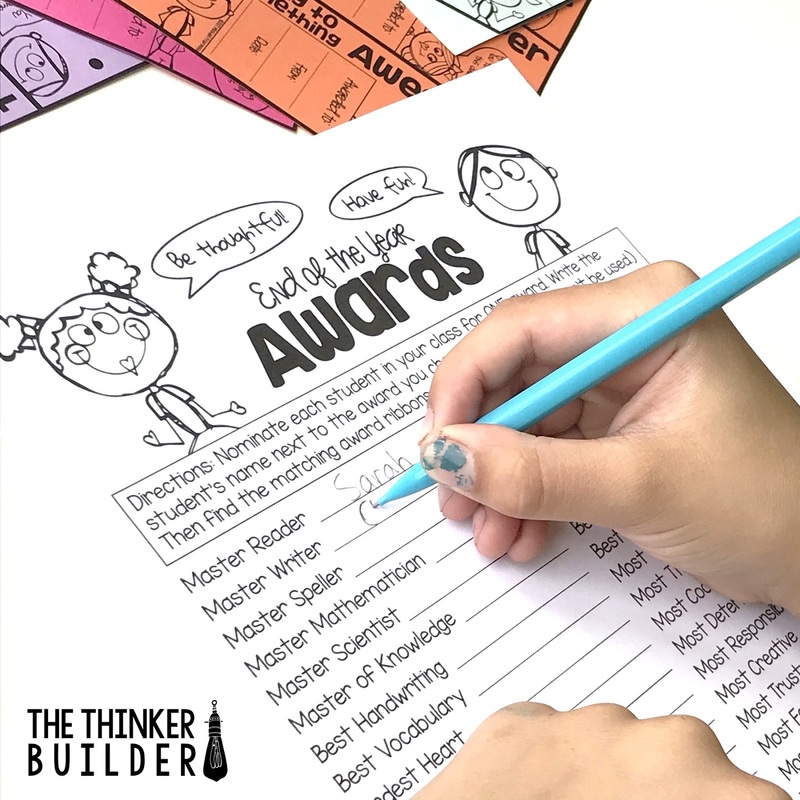 Think about character traits, multiple intelligences, and "most likely to" types of superlatives. The Award Ribbons in the pics come with 40 categories. Some of my favs include Legendary Leader, First-Class Friend, Stellar Citizen, Master Mathematician, Most Dependable, Most Fearless, and Most Likely to Invent Something Awesome. Click here to see the full list of categories. Some students will stand out. You'll think, I could give this student a dozen different awards and they'd all be deserved. And you'll have a handful of students that will be difficult to find many awards that fit. Just remember, it's often these students who need the positive recognition and grace the most. When you are going about matching students with an award, try starting with the most challenging students. Having trouble still? Try connecting the award to one single event in which the student exemplified the trait or superlative. And don't be afraid to double up categories. Maybe you select a smaller number of awards but give each one to multiple students. 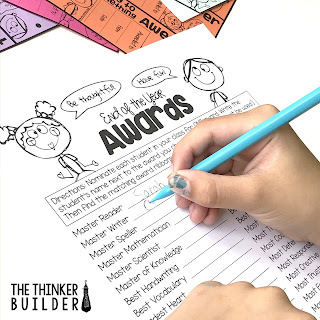 For a unique look, try printing the awards on brightly colored card stock, and writing the students' names and dates with a metallic sharpie or paint pen. Add a coordinating bow for a finishing touch. Planning on sending students home for the summer with the gift of a new book? Stick their awards inside like a bookmark and present them together! Or, Let Your Students Decide! 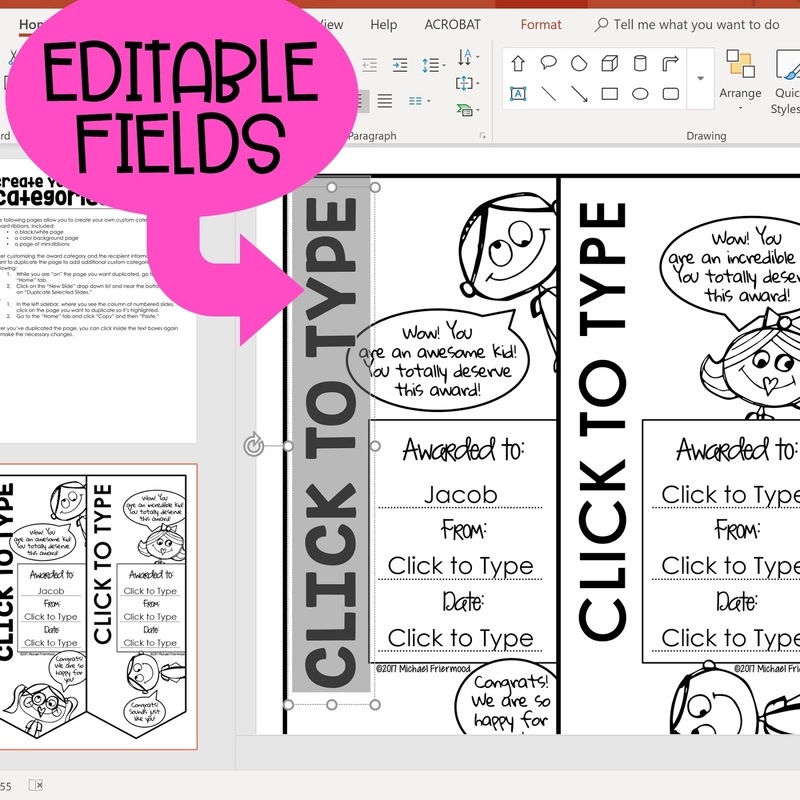 One of the coolest things about this End of Year Awards resource is the option to allow students to give awards to their peers. You could choose to give each student a nomination sheet to vote for each award, and then tally the results privately. In this way, each student would still receive one award, but their classmates have a voice in who gets which one. But often, a more meaningful plan is to allow each student to give an award to EVERY STUDENT. Yeah, that's right. All students give all students an award. How? It's actually pretty simple with the materials included. Each student gets a nomination sheet and a set of mini-ribbons. Then give the class time to individually choose which award to give each classmate. Then, students fill out the appropriate mini-ribbons with their chosen recipients, cut them out, and punch a hole at the top. Once students have their awards ready, have all students take walk about the room and set each award on the desk of the matching student. When students return to their seat, they'll find a whole slew of awards, one from each of their classmates, thoughtfully chosen just for them. Hang them on a metal ring, and each students get to take home a whole stack of awards! You can get the End of the Year Awards seen in the photos of this post by clicking HERE or the picture below. During your year-end celebration, in addition to passing out the class awards, it's a great time to have students sign each others' yearbooks or the memory books they've been working to finish. 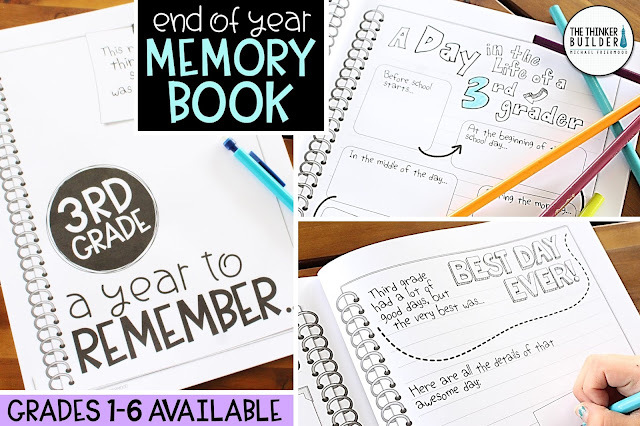 See my memory book for grade one, two, three, four, five, or six. 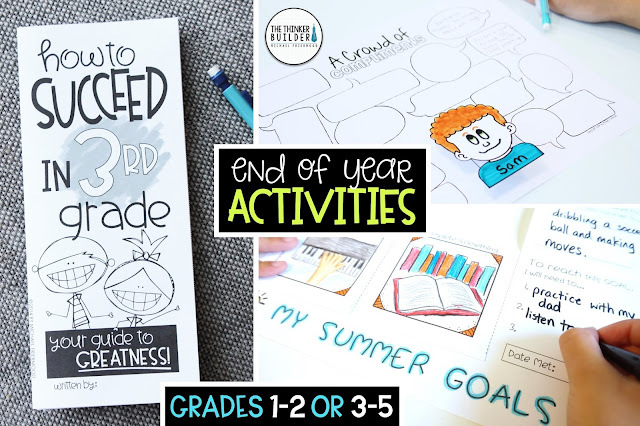 It's also a great time for students to share a few of their finished end of the year activities with each other, like their "Song-and-Dance of Learning" or their "Summer Goals Flap booklets." 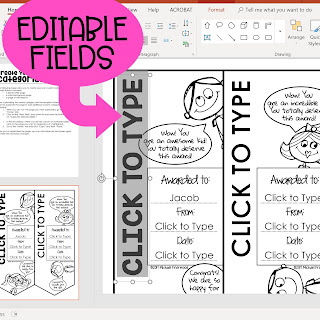 Check out the Grades 3-5 edition or the Grades 1-2 edition. 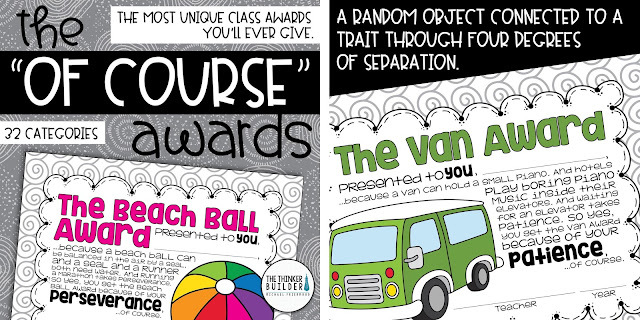 And if you're looking for a completely different spin on end of the year class awards (and you have a sense of humor), check out my "Of Course" Awards. Whatever activities and resources you use at the end of the year, I hope it's memorable! Need an image to save this post to Pinterest?